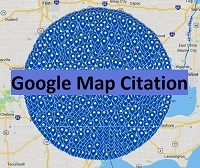 what is a map citation? Answer:A map citation is simply mentions of your business Name, Address & Number (NAP) from across the google-map . This gig works any where in the world. This gig help for local ranking for your local business ranking. .Manual work and 100% Nap Citations. .Your Business details show up in Maps. .We offer a customer satisfaction 100% guarantee. .Your Business address show up in Maps. 250++ Google Point Map Citation To Rank Up your Business for is ranked 5 out of 5. Based on 4 user reviews.